In mid-August I photographed the annual Perseid meteor shower. 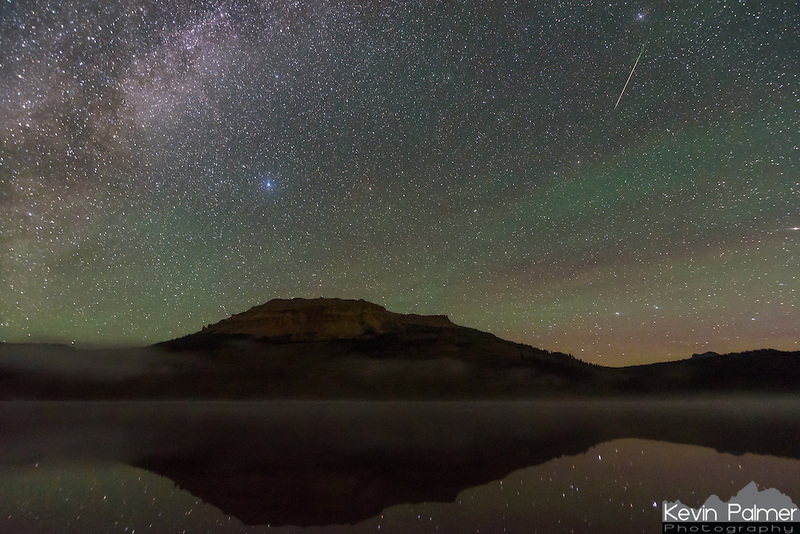 But this was no ordinary year, as there were twice as many meteors as normal. Beartooth Lake, at almost 9,000 feet in the Beartooth Mountains was the perfect place to watch from. I was worried about the weather, with thick clouds at sunset and a wildfire only 7 miles away. But it ended up being a beautiful night. The show got started at 1AM when the moon set, leaving the sky completely dark. While listening to every little sound around me (this is grizzly bear country) I counted 250 meteors in 4 hours. This was one of 93 that my camera captured over Beartooth Butte. The radiant (Perseus) was to the upper right outside of the frame. As dawn approached, fog swirled around the glassy surface of the lake. Hand warmers strapped to my lens prevented the glass from fogging up. I don't know how cold it was, but I do know my water bottle froze and I was snowed on at the pass earlier in the evening.